Plasticine is one of those toys with which we all played during our childhood, surely without exception. And it was invented by one William Harbutt, who was born in North Shields. Harbutt entered this world in 1844, the seventh of eight children of Thomas Harbutt, who ran a local galvanising works which served the Tyne shipyards. 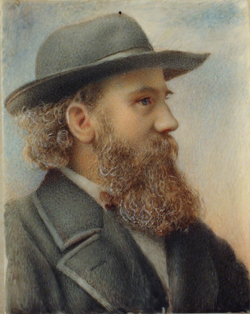 Little is known of his early life, though he ended up at the National Art Training School in London – eventually becoming a teacher of art and an associate of the Royal College of Art. In 1874 he became headmaster at the Bath School of Art and Design, and in 1877 opened his own art school together with his artistically talented wife, Bessie. At some point in the 1890s (1895 or 1897, accounts vary), he developed the new-fangled modelling clay out of utter frustration at the materials currently available for use by himself and his sculpture students. Crucially, it was non-drying, as well as being non-toxic and extremely malleable – though its exact composition is still kept a closely-guarded secret even today. He was granted a patent in 1899, and commercial production began in Bathampton in 1900. Originally grey, the range of colours soon expanded as its popularity as a toy among children grew. It continued to be manufactured in Bathampton until 1983. Harbutt himself travelled widely to promote his invention, and died of pneumonia whilst on a trip to New York in 1921, aged 77. For an interesting little piece on plasticine, see here.